Pasta is a common Italian dish that is now enjoyed around the world. Whether used in fettuccine alfredo, pasta alla norma, or penne all’arrabbiata, there are a million ways to enjoy this versatile and tasty dish. Head to one of these 10 South Dakota restaurants for pasta like you’ve never tried before! Nemo is a tiny town in the Black Hills outside Rapid City, but this small town has a big secret: the delicious pasta and other dishes at The Pasta Corral. This restaurant is quaint, with modest decor and atmosphere, but the waitstaff is friendly and it's always packed to the brim with hungry locals. The menu has several sandwich, salad, and dessert options, but the real gem is their pasta. Customers rave about the cavatappi pasta, which is served with a choice of either Bolognese or alfredo sauce and either Italian meatballs or grilled chicken strips. After finishing the huge plate of pasta, make sure to try one of their mouthwatering desserts like fresh fruit, chocolate suicide cake, biscotti, or tiramisu. Deadwood is one of the most famous, lively towns in South Dakota and attracts tourists due to the historic sites, party atmosphere, and array of gambling. But pasta lovers also flock to this historic mining town to try the dishes at Harry’s Spaghetti Western Restaurant. 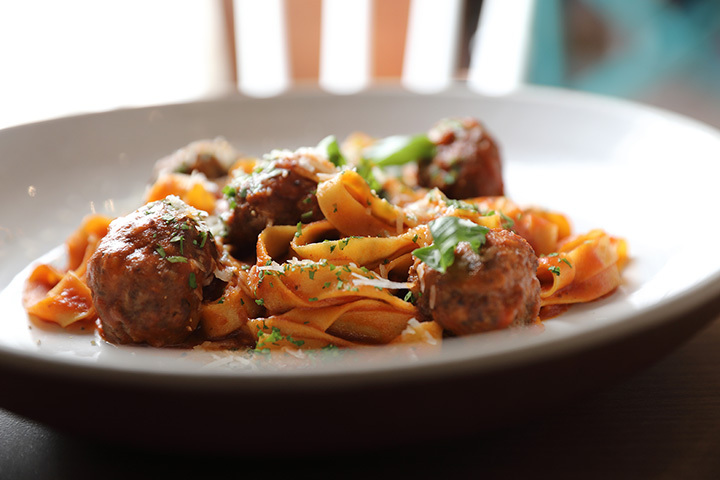 The menu features a huge selection of options for build-your-own pasta dishes. Customers choose their type of pasta, sauce, and meat, and the expert chefs whip up a tasty pasta plate perfectly for the customer’s palate. Each meal also comes with bread and salad, so you will never leave hungry. This Deadwood restaurant is a pasta lover’s paradise! Spezia is one of the classiest restaurants in Sioux Falls, with an authentic Italian atmosphere and creative menu options. The menu includes favorites like calamari, salads, plenty of gluten free options, soups, charbroiled steaks, seafood, and more, but their most acclaimed items are their pasta dishes. Customers can choose from mouthwatering dishes like French Acadian chicken linguine, squid ink pasta fra diavolo, salmon alla rosa, shrimp francese capellini, eggplant parmigiana, and many many more. There is something for everyone at this upscale Italian eatery. Roma is praised by customers for their masterful blending of modern hospitality with old fashioned charm, not to mention their authentic Italian cuisine. The talented chefs serve up both northern and southern Italian dishes. The restaurant serves up a nice variety of food items like pizza, salads, seafood, veal, chicken, and, of course, pasta. There are plenty of pasta choices from manicotti to ravioli to angel hair pasta, and they even offer a pasta sampler for those who are indecisive which includes manicotti, lasagna, and cheese ravioli. You’re not going to want to miss Aberdeen’s most authentic Italian establishment! Located conveniently in the heart of downtown Rapid City, Botticelli Ristorante is as authentic as they come. The atmosphere is classic and elegant and the food is divine, no matter which menu item you order. The menu offers everything like antipasti, insalate, pasta, pollo, carne, pesce, dolce, and contorni. While there are plenty of items to choose from, customers especially rave about the manicotti dil forno, cannaloni di pollo, tortellini alla panna, fettuccine alla carbonara, and fruitti di mare. The Deadwood Legends Steakhouse is where the rich and famous dine when they come to town. This acclaimed steakhouse is located inside the Silverado Franklin Hotel and is an essential part of the Deadwood experience. The restaurant has a creative menu which includes chicken, seafood, steaks and chops, dessert, and pasta. The pasts is either shrimp or chicken sweet pepper pasta, which is made with pappardelle pasta with spinach, peppadew peppers, and parmesan cream sauce, and served with a choice of soup or salad. La Minestra is situated inside a historic building right in downtown Pierre. Customers rave about the elegant atmosphere and unbeatable Italian and American dishes. The restaurant uses only Black Canyon reserve beef, and all of the steaks made are hand cut with care and cooked with expertise. The pasta is another area where La Minestra does everything right. Pasta is made fresh daily and the menu offers a huge array of pasta options with something for everyone. Some local favorites are the Thai chicken pasta, chicken tortellini, Cajun lobster pappardelle, or smoked salmon rigatoni. Stonewalls in Rapid City specializes in delicious seafood, but they have so much more to offer. The expert chefs serve up fresh salmon, weekly specials with grouper and halibut, pasta options, fresh stone oven pizza, and healthy salads. While the seafood is delicious, the pasta is to die for. Local favorite pasta dishes are the prime rib tortellini, Neapolitan puttanesca, stuffed chicken parmesan, and creole style pasta. After a long day of hiking in Custer State Park, head to nearby Sage Creek Grille for a meal you won’t soon forget! This downtown restaurant serves up creative interpretations of American cuisine with a diverse menu. Whenever possible, this eatery utilizes fresh and local food sources, so all menu items are as fresh and delicious as possible. Make sure to wash it all down with one of their many available craft beers. Vermillion’s Little Italy’s has a big flavor packed into a small restaurant! The yummy menu includes gyros, calzones, sandwiches, flatbreads, chicken, shrimp, nachos, pizza, salads, and several pasta choices like tortellini, ravioli, lasagna, manicotti, fettuccine, spaghetti, and shrimp and lobster scampi.